Brands are becoming more and more aware of the impacts influencer marketing can have on their business. Utilizing influencers with a similar target audience as your own can be a fantastic way to reach them in a new way. Not to mention the proven statistics that consumers now prefer the word-of-mouth of other people that they trust versus listening to traditional forms of marketing. But with the rise of influencer marketing we’re seeing more and more people wanting to become famous on social media. They see the glamorous life that influencers paint on their feeds which makes them look like all they do is post a picture and get stuff for free. Reality check, that’s not how it works. As a blogger myself, I’ve worked with a few different brands both big and small. 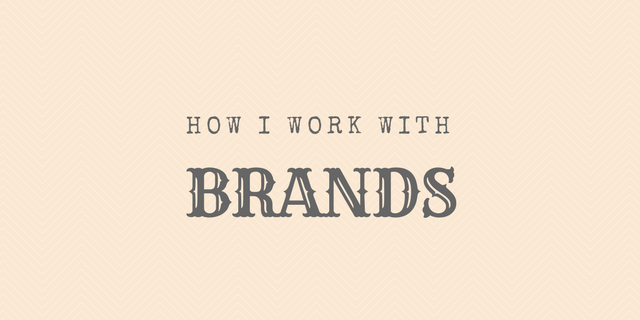 So I wanted to shed some light on how I make it happen and some things to keep in mind if you want to work with brands one day too. You should have a media kit or something that shows who you are, your audience, followers, etc. Your pitch email should be short and sweet. Explain who you are, what your blog/social media is all about and what you are looking for. Remember that there has to be a win-win for the both of you. For example if you’re asking for a free/discounted product, offer a blog post, professional photos of their product and social media coverage. Be realistic! No one is going to give a person with 1,500 followers a free GoPro. Be open to hearing their ideas as well! Maybe you won’t get exactly what you’re asking for but you may be able to build the relationship with a brand you love which in the end, can be more valuable. Email the PR/press person listed on their website if it’s available versus a generic email address. As a travel blogger, I find I have the most success reaching out to smaller/boutique brands. So for example, instead of pitching the Tourism Board of Chicago, who likely will ask for a huge following, I’ll pitch boutique hotels or tour companies in Chicago instead. Once you start to build up a following you may end up having brands reach out to you. This can be great, but also can really reveal to you a lot about how brands don’t fully understand influencer marketing yet. It’s important to remember your worth. If it’s a brand you love and would genuinely use, then maybe it’s worth working with them, however, if it’s something you don’t believe in, don’t do it just for the free stuff. Also take a look at what they’re asking. Some brands just ask for way too much! They may ask for a blog post and social media coverage without even offering YOU anything in return. You deserve to be compensated in some way, shape or form. Don’t be afraid to stay true to yourself and say no. Disclaimers are very important when working with brands because social networks and the advertising standards organizations are really cracking down on disclosing when you are being paid to promote something. By paid, that includes if you received something for free too! Although they aren’t too strict with people that have smaller followings, it’s better to be safe than sorry. Plus, I think it’s important to disclose to your followers. I pride myself as a blogger to only talk about and promote things I have tried myself or would legitimately recommend or use. This I feel helps me remain authentic and not just a walking billboard. Working with brands can be incredibly exciting as a blogger, whether you’re new or a seasoned blogger. However, my biggest piece of advice is to stay true to yourself, remain professional and don’t appear too hungry! Know your worth and the right opportunities will come.